On occasion there are issues so deeply divisive in a community that the noise surrounding them becomes a cacophony. It becomes increasingly difficult to determine what opinion prevails and increasingly impossible to determine direction as the varying voices drown each other out. In these rare situations you can find your community not only at a standstill but deeply divided along battle lines, with a defined battleground but no clear way to determine who will - or should - win. There are times when it becomes increasingly difficult to achieve compromise, let alone consensus, and where it seems there is no good way to determine future direction. I believe we have reached this watershed in Fort McMurray, and watershed is a bit of a play on words as it all revolves around development of our waterfront property in the downtown core. When I look back at the entries in this blog some of the earliest involve waterfront development - from three years ago. This was a contentious issue then and continues to be today, with little resolution becoming apparent and little common ground being developed. It has reached a point where I have little opinion as to what the proper course of development should be on the waterfront but an increasingly deep feeling that we must resolve this issue and rapidly so we can start moving into the future. I was at my local coffee shop recently and I admit I was eavesdropping on a conversation between a group of local women, most of whom had babies and young children with them. I was troubled to hear them as they discussed leaving our community, not because they or their spouses had secured employment in other communities, but to join the ranks of "fly in, fly out" employees and families who have chosen to live in other places while the primary wage earner continues to work here. Their reasons were troubling to me. Most centred on quality of life, concerns about housing costs, health care, daycare availability and retail services. Some focused on the lack of amenities and services, and one comment mentioned the appearance of our downtown core, with the ever-present graffiti. But there was one word used by one individual that deeply troubled me and indicated to me why we should act, and act now. The soft female voice said the word only once, but referred to the fact that the community did not seem to be progressing in a firm and solid direction. It said so many things seemed to be stalled, from developments downtown to aging in place facilities to all the many other things we say are "in the works" but that we all acknowledge have not yet been achieved. That stagnation includes our waterfront, a project that has stalled out in many ways as we seem to struggle to find direction, and last night when a group representing user groups of the Snye presented to council I realized we need to find the answer to one very simple and basic question: what exactly do we want our waterfront to be? I don't mean the height of the buildings or the types of residences and commercial spaces. Those are the fine details of the issue. It is a far broader issue and question: Do we want the waterfront to be pure parkland with usage preserved for the historical use of the water, including float planes and current users of motorized craft, or do we want to head toward a model of mixed parkland and commercial and residential developments and the resulting fine decisions to be made? Referendums are a drastic step, of that there is no doubt. It is something I have rarely thought was the correct course of action, but this situation has reached a point where it may well be the only option that allows us to go forward with confidence. The current situation is dividing our community, and frankly I believe the delay in development may well be encouraging people to move away from our community, losses of people and families from which we may never recover. Today I sent a brief email to RMWB Mayor and Council, the text of which follows. I don't necessarily believe council will support this concept, but I felt I would be remiss if I did not at the very least present it as a viable option to resolve the current dilemma we seem to be facing. We cannot allow the Snye, our waterfront or our community, to stagnate. 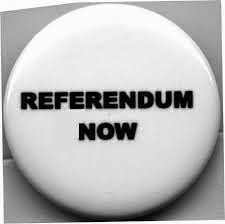 I believe a referendum may represent our best option to move forward. At the very least, I believe it is something we must consider. It is with increasing alarm that I have been watching the ongoing debate regarding waterfront development in downtown Fort McMurray, particularly along the Snye. The divisions this debate has created not only continue to be apparent but appear to be increasing in depth and are subsequently contributing to the division of our community. The ongoing battle is proving to be damaging to the community as a whole as direction on the development falters and seems to fail to find traction. I believe the time has come to pursue a new strategy, particularly given that a recent collection of groups presenting to council suggested that the appropriate course of action is to rezone the waterfront as entirely parkland. This is in conflict with current direction on waterfront development and to me signifies the depth of division on this issue as it seems we are struggling to reach compromise, let alone consensus, on even such a basic point that will determine the future of the waterfront and any development taking place on it. Today I would like to suggest that this issue has reached a point where the wisest course of action may well be to put the very basics of waterfront development to referendum. The finer points of development can be decided by committee advice, such as building heights, nature of residential and commercial developments, etc, but this very basic point of the starting point of zoning the area is the key factor in determining how we move forward. I understand an online survey has been initiated regarding waterfront development, which is a fantastic step in taking a pulse on the community mood and thoughts on development, but it is of course non-binding and in terms of statistical relevancy can be skewed by several factors. A referendum, however, allows each resident and citizen one vote and one opportunity to set the very basic direction of waterfront development. Referendums are expensive, messy and not without controversy. It is not something I advocate lightly and not a step I would suggest without good reason. I have come to believe that a binding vote in which the majority of the people indicate their preference for waterfront development may well be the only way to move forward on the issue and while it may not achieve consensus will achieve a defined result. The question posed could be an extremely simple one: do you want the waterfront area zoned as parkland and preserved for the historical usage of the area including float planes, or do you want a development that includes commercial and residential spaces along with defined parkland spaces and more controlled access and usage of the water? This very basic question would serve well as a starting point in the development of the waterfront and a referendum would provide a strong and clear direction on how to proceed as opposed to the current cacophony of noise on either side of the debate with no definitive way to measure which position represents the majority. I humbly request that you as our elected community representatives consider this option and how it may assist us in resolving the issue and continuing to improve our community for the benefit of all.